What an amazing story.... one that moved me to tears and made me think again about the power of words and the power of the human spirit. Over the past few years I've read several books that gave me insight into the lives of other people who lived in countries that faced brutality and death on a regular basis. Fictional accounts, yet historically accurate in many ways, these books made me more aware of the vast differences that exist in our world. This weekend, with nearly 90 essays to grade, I kept stealing moments with The Book Thief. Essays lay on my lap, while The Book Thief remained on top, open to its story. As I stumbled through the last pages, I was in tears, wrapped in emotion so heart-breaking that it pained me to realize that this story could have been true of the children and adults who lived through the Nazi regime and the ally invasion that finally ended World War II. In the beginning, I found the book difficult. Written from the perspective of death, I kept wanting to move into the story of Liesel... I didn't care at first to read what Death had to say. But as I continued to read, I became one of the people of Himmel Street, and I stayed there until the very end. The essays await, visits to you are still to come, but I wanted to share this remarkable story with you. 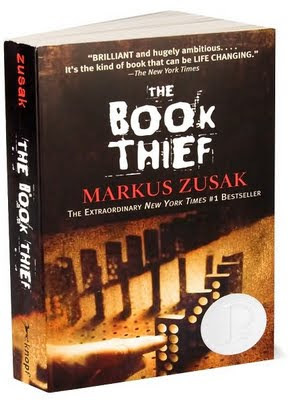 Written by Australian Markus Zusak, it's a book you won't want to put down. Read it when you can.... and let me know what you think about it. This sounds like a really intense book...not sure if I can handle intense right now. I am in the midst of my Tuscan romance (hardly that emotional and raw)...but it's a really good escape. I will put this book on my list of good reads. Hope all is well...I know you must be swamped with papers and teaching. I so appreciate you stopping by for a visit :) Be well. Oh, that sounds so good! I love historical fiction. I also pretty much love any book about WWII and have since high school so I will add this to my "must read" list! For some reason I really like books that I have a hard time getting into at first, weird I know, but it really makes it worth it when get addicted halfway through. Thanks, I love hearing about good books. Thanks for the recommendation! It's going to be a while before I get to steal away alone to a tropical island somewhere to read all the books I have on my mental list, but one day... one day. Do you know how much I love that you would leave 90 essays sitting while you are lost in a book? Kindred spirits. That's what we are. Roban your description of this book definitely makes it a must read! We need to be moved to tears more often. We live such sheltered lives and are sometimes totally unaware of the vast differences that exist in our world. I will put it on my reading list. So glad you stopped by my blog. The Book Thief is on my top five list. It was a perspective that we don't often think of, I think. I know the war was awful. I've watched movies and documentaries that detail the misery of concentration camps, the brutality of annihilation. But what of the innocent people, the good, decent, kind people who lived in a country taken over by a blood thirsty dictator? There story isn't told very often. My son has a good friend who's grandfather was a fighter pilot in World War II and frequently tells his grandchildren stories of the war. One afternoon I heard my son, and this friend playing the classic good guys/bad guys game that children play, except they referred to the bad guys as Germans. It was innocent, and I didn't fault them, but we sat down right then and there and had an eight year old lesson on humanity. I guess what the book taught me is that there is always more than one perspective. That is an inadequate and much too broad summary, but for fear of writing a comment longer than your original post, I'll stop. Oh wait... one more thing. Have you read The Pianist? Oh, how I love that book as well, and it's a true story, so all the more emotional. I checked it out the same time I checked out the Book Thief, actually, and now I own them both. It's a beautiful story as well, with mercy and love coming from a very unlikely source. A movie was made and was a beautiful and very accurate depiction of the book. Oh gosh. So sorry. Absolute holy long comment alert! Crazy! I JUST ordered this book a few days ago. It should come in the mail any time. I'm so looking forward to it. I've heard it's an amazing book. Now I want to read it even more! I totally agree. A wonderful, life-changing book, overflowing with thought-provoking originality. I was in awe. Oh, The Book Thief is another of very few books I've marked as Life-changing. I loved what it had to say about the beauty of a soul, the bonds of friendship, and the power of words. I loved what it was able to say in those books-within-the-book. And the characters will haunt me forever!